The first two brand new BYD/ADL all-electric single-decks have taken to the streets of London on the Red Arrow route 521 (Waterloo Station & London Bridge Station). Operated by Go-Ahead London General from their Waterloo (RA) base, eventually fifty-one of these joint Chinese and British built 12-metre long BYD K9E with ADL Enviro200 MMC type bodywork will operate route 521 and the 507 (Victoria Station & Waterloo Station). With rather odd looking fleet numbers SEe1-51, it was numbers 5 and 7 that first appeared in revenue-earning service, number 5 shown here as it headed south over Waterloo Bridge during Tuesday afternoon. Yesterday (Wednesday), two further contracts awards were announced for introduction on the 1st April 2017. 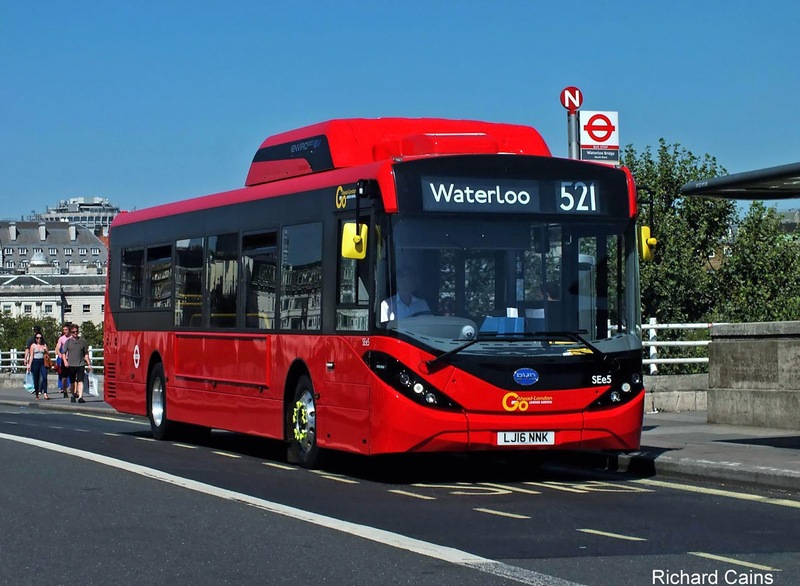 82 (North Finchley & Victoria Station) Awarded to Tower Transit with new hybrid double-decks. Currently operated by Metroline Travel with TE-class ADL E40D Enviro400 diesel double-decks from Potters Bar (PB) Garage. A night element will be added thus the route will become a 24-hour service. N113 (Trafalgar Square & Edgware Station) Both routes retained by Metroline Travel using existing fleet Euro-V hybrid TE-class ADL E40H Enviro400 double-decks currently on route 139, and be upgraded to Euro-VI standard. Additional hybrid double-decks will also be required to serve the increased peak vehicle requirement. However, please note that there is currently a consultation programme out for routes that serve much of the Finchley Road corridor in north west London. Significant changes are expected and are built in to the awards of the two respective contracts. Results of the consultation will affect routes 13/N13,82,113/N113 and 139/N139. 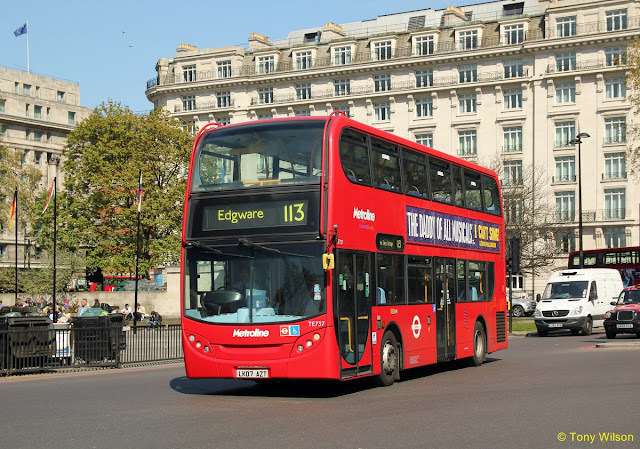 Proposals include the 82 to become route 13 (North Finchley & Victoria Station) and the 113 be re-routed back to Oxford Circus instead of Marble Arch.